Finding herself in a new home in Brighton, Kate Bradbury sets about transforming her decked, barren backyard into a beautiful wildlife garden. She documents the unbuttoning of the earth and the rebirth of the garden, the rewilding of a tiny urban space. On her own she unscrews, saws, and hammers the decking away, she clears the builders' rubble and rubbish beneath it, and she digs and enriches the soil, gradually planting it up with plants she knows will attract wildlife. She erects bird boxes and bee hotels, hangs feeders and grows nectar- and pollen-rich plants, and slowly brings life back to the garden. But while she's doing this her neighbors continue to pave and deck their gardens. The wildlife she tries to save is further threatened, and she feels she's fighting an uphill battle. Is there any point in gardening for wildlife when everyone else is drowning the land in poison and cement? Throughout her story, Kate draws on an eclectic and eccentric cast of friends and colleagues, who donate plants and a greenhouse, tolerate her gawping at butterflies at Gay Pride, and accompany her on trips to visit rare bumblebees and nightingales. 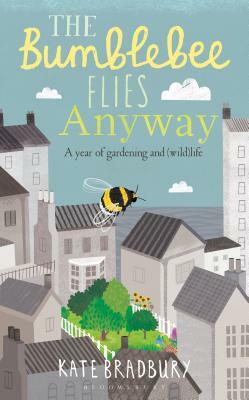 Kate Bradbury is an award-winning author and journalist, specialising in wildlife gardening. She edits the wildlife pages of BBC Gardeners World Magazine and regularly writes articles for the Daily and Sunday Telegraph, The Guardian, RHS magazine The Garden and BBC Wildlife and BBC Countryfile magazines. In 2015 she became the first Butterfly Ambassador for conservation charity Butterfly Conservation, and she writes a quarterly column for its magazine, Butterfly. Kate regularly talks at events and festivals and appears on radio including BBC Gardeners Question Time and the popular RHS gardening podcast. She also makes wildlife gardening videos for gardenersworld.com. She lives and breathes wildlife gardening and is currently transforming a tired north-facing patio garden into a wildlife oasis, where she hopes to attract a wealth of creatures including frogs, toads, newts, birds, beetles, hedgehogs, butterflies, not to mention her very favourite, and first love: bees.